Whether you have decided to undergo hip replacement surgery, or are just beginning to explore treatment options, the purpose of this piece is to help you understand the benefits and limitations of the procedure. We will explain how a normal hip functions, the sources of hip pain, what to expect after undergoing hip replacement surgery, and what exercises and activities will help restore mobility and strength. If your hip has been affected by arthritis, a fracture, or any other condition, simple activities such as walking and sitting down/standing up can become painful and difficult. Your hip will feel overly stiff and it may be difficult to put on shoes and socks. You may also feel pain and discomfort when resting. In the event that medicines, alterations to daily activities, exercise and the use of walking supports do not help reduce or eliminate symptoms, your doctor may recommend that you consider hip replacement surgery. Being safe and effective, hip replacement surgery is a good option for those looking to reduce pain, increase mobility, and ultimately get back to normal. Hip replacement surgery was first performed in 1960 and has since become one of the most successful operations in medicine. Since that first hip replacement in 1960, improvements in joint replacement surgeries and related technology have increased the overall effectiveness of a total hip replacement. According to the Agency for Healthcare Research and Quality, more than 300,000 hip replacements are performed annually in the United States. With a total hip replacement—which is also referred to as a total hip arthroplasty—the damaged bone and cartilage is removed and replaced with prosthetic parts. 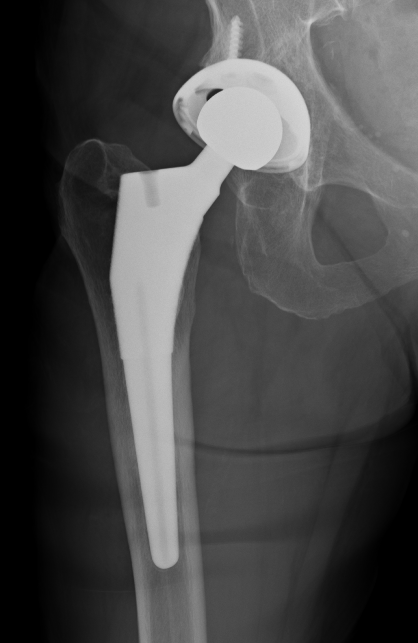 The damaged femoral head will be removed and replaced with a metal stem that is placed within the hollow middle part of the femur. The femoral stem may be fitted with cement, or via a process known as “press fit,” where it is literally pressed into place. A metal or ceramic ball will be placed on the upper part of the stem. This ball will replace the removed, damaged femoral head. The damaged cartilage surface of the socket—known as the acetabulum—is extracted and replaced with a metal socket. Screws and/or cement will be used to hold the socket in place, if necessary. A liner will be placed between the new ball and socket to allow for a smooth gliding surface. On the day of surgery, you will be admitted to the hospital or surgical center at which the procedure will be performed. Once you are admitted, you will then meet with an anesthesiologist and discuss your anesthesia options. For this procedure, there are two common types of anesthesia used. One is a general anesthesia that will put you to sleep throughout the duration of the surgery, while the other options include spinal, epidural, or regional nerve block anesthesia. With these options, you will be awake but certain parts of your body will be numbed. Based on your preferences and the recommendations of the anesthesia team, the most appropriate approach will be determined. Artificial hip joints are comprised of many different styles and designs, adapted for the specific situations in which they are used. Despite their differences, all of them consist of two basic components: the ball (made of highly polished metal or ceramic material) and socket (strong cup of plastic, ceramic, or metal, which may have an outer shell made of metal). Sometimes, the prosthetic components may be “press fit” into the bone to allow the bone to grow onto them, or they will simply be cemented into place. Whether the parts are press fit or cemented depends upon a number of different factors, including the quality and strength of your bone. On occasion, a combination of a cemented stem and non-cemented socket can be used. The prosthetic parts that are used will be something that your surgeon determines and discusses with you prior to any procedure. The hip arthroplasty procedure typically takes up to an hour, during which your orthopedic surgeon will remove damaged cartilage and bone and subsequently position new plastic, metal, or ceramic implants with the goal of restoring the positioning and overall function of the hip. Once surgery has been successfully completed, you will then be transported to a recovery room where you will stay for a few hours so that your recovery from anesthesia can be monitored. Upon waking up, you will be taken to your hospital room. Though many people will not believe this, the success of the surgery will depend, in large part, on how closely you follow your surgeon’s instructions regarding home care following your procedure. In some cases, hip precautions (movements you should avoid) will be taught to you. Avoiding these movements early in your recovery can help prevent dislocation. Most patients will have stitches or staples to close the wound created by surgery, while others will have sutures beneath the skin. Typically, stitches and staples will be removed about 2 weeks after surgery. You will be instructed to avoid getting the wound wet until it has completely sealed and dried. You will also be instructed to continue bandaging your wound in order to prevent irritation from clothing. It is not unusual to have a loss of appetite for a few weeks following surgery. A balanced diet, along with iron supplements, will go a long way in restoring muscular strength and will promote proper tissue healing. You must be sure to also drink plenty of hydrating fluids. Exercise is a pivotal part of home care, especially during the initial weeks after your procedure. Within 3 to 6 weeks, normal, light activities can be resumed. You will experience discomfort, especially at night, for several weeks. A gradual walking program that will slowly increase your mobility. Initially, exercises can be performed inside your home, but will gradually move outside. Slowly and carefully resuming other normal household activities, such as sitting down and standing up, and climbing stairs. Specific exercises that are to be performed multiple times a day aimed at strengthening your hip. Most people can perform these exercises with little to no help, but others may need a physical therapist to help you perform these exercises either at home or at a therapy center. Many patients report numbness of the skin around the incision site. In addition to this, stiffness and some bleeding are present. 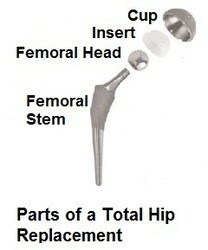 Over time many of these symptoms diminish, and most people find that they are minor inconveniences compared to the pain and discomfort experienced prior to hip arthroplasty surgery. It is important to note that the components of your new hip may activate metal detectors that are used in airports, stadiums, and other buildings. Most people ask their orthopedic surgeon for a card or a letter that certifies they are in possession of an artificial hip. It is also recommended that you take oral antibiotics prior to any future dental appointments to significantly reduce the risk of infection.